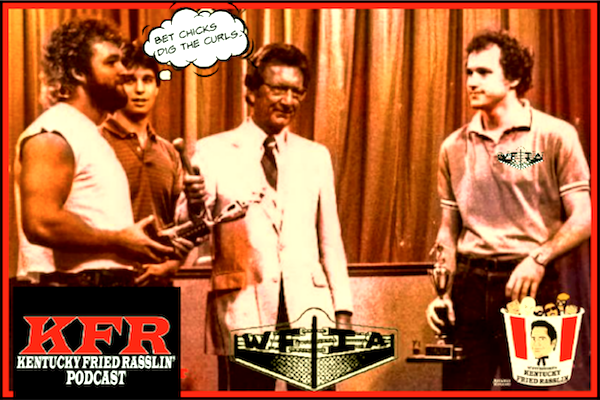 USWA Monday night wrestling returns with another wild-and-wooly KFR podcast with special guest “Dangerous” Doug Gilbert reuniting with his former manager, Scott Bowden. Doug discusses growing up in Lexington, Tenn., as the son of sensational ring technician Tommy Gilbert; his brother Eddie Gilbert’s booking philosophy; memories of being terrorized as a boy by the original Sheik; his first angle as a 15-year-old in ’84; working for Crockett as a teenager; why he turned down a shot to work for Vince McMahon in favor of Japan; getting cussed out by Jerry Lawler for our rather inappropriate language during live Memphis TV; and his thoughts on everyone from the King to Terry Funk to Nick Bockwinkel. Don’t miss Doug Gilbert and Scott Bowden joining forces once again for an no-time limit, no disqualification discussion of all things Memphis!